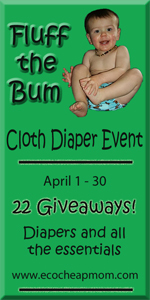 During the month of April Eco Cheap Mom will be hosting a month long Fluff the Bum cloth diaper event with 22+ cloth diaper and various cloth diapering accessories reveiws and giveaways. If you want to grab some extra entries then read here about how to get them. Otherwise be sure to check back in April for all the great information and giveaways!